2018 is a going to be great year for your beauty game. Yup, from peanut butter eyeshadow to Kirakira lip gloss, we predict these will be the biggest makeup trends of next year (And spoiler: They're all insanely pretty). Kirakira took over our Insta feeds in 2017, but come 2018, the flare filter will be taking over our makeup. Draw your inspo from makeup artist Bea Sweet and give your lips some Kirakira sparkle IRL, with a clear glitter lip balm or gloss. Whilst glitter is taking over our eyes and lips (see above^^), cheekbones will remain officially shimmer-free in 2018. Yup, highlighter goes glossy and ultra-natural—think pearly creams and dewy balms, as opposed to high-impact sparkle. Blocky brows are a thing of the past, 2018 calls for clean, feathery, brushed-up brows. For added definition, comb a little powder through your arches to enhance the shape, then take a clear mascara and brush the hairs upward. The formula will set brows in place and give a subtle glossy finish. White liquid liner proved a huge hit on the Spring Summer 2018 catwalk. Designer Laura Biagiotti gave models a white-winged eye, while keeping the rest of their makeup clean and minimal. Step away from that high-volume mascara, because low-key lashes will have a moment in 2018. The subtle flutter requires one to two coats of mascara, max. Whoever said romance is dead has been spending too much time on Tinder (aka, me), and not enough time drooling over the makeup look from Cynthia Rowley's Spring Summer 2018 fashion show. The soft, peachy, smoky eyes and petal-pink lips were the epitome of romance. This is one to watch for Spring/Summer, trust me. ICYDY, Glossier stole the hearts of many beauty girls all over the world, and with it came a desire to go glossy IRL. Move over matte lips, because lipgloss is making a comeback in 2018. Yep, you read that right. Our beauty inspo for 2018...peanut butter. Trust MAC's Director of Makeup Artistry, Terry Barber, to make us want to slather the nutty stuff all over our eyelids. But before you reach for that jar, try a tan-colored cream eyeshadow, instead. Trust me, it'll be wayyy less messy. If you've long-struggled to draw that perfect eyeliner wing, I'm here to tell you that the struggle is over. Forget the classic cat-eye, take a page out of makeup artist Kate Jane Hughes' book, and opt for dots instead. Simple, chic, stunning. A sprinkling of holographic glitter over the eyelids made an impact at the Stella Jean SS18 show. Take a glitter eyeliner or eyeshadow and press it onto the lids, blending any excess up to the brow for a graduated sparkle. We're over the basic bronze; with 2018 comes the "rosy tan." Think: pinkish, sun-flushed cheeks. Create the look by mixing a little blusher in with your bronzer and buffing over the high points of your face to give skin a warm, summery feel. Every beauty brand from Tom Ford to 3ina are getting in on the glossy eyelid action, so it looks like the trend is officially here to stay (and we've got so much time for it). Paint some shine over your everyday eyeshadow to instantly give your makeup an edgy update. South Korea's biggest Beauty YouTuber, Pony, is one to follow for 2018. Her kawaii makeup (literally) outshines everyone else. 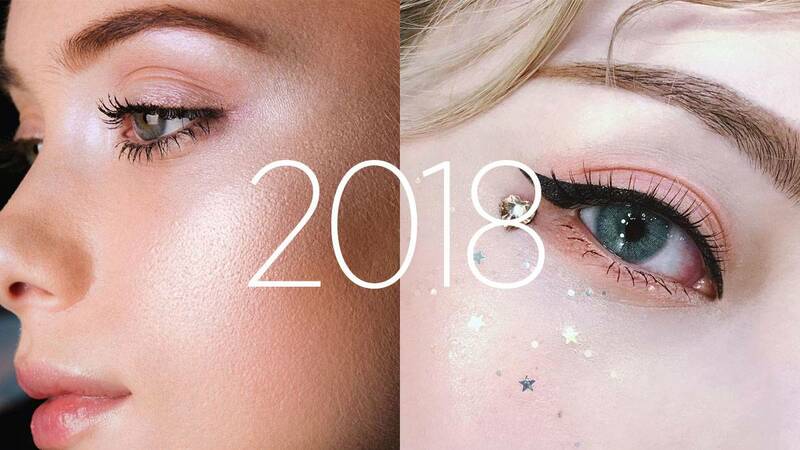 Why not take inspo from her and add some sequins and stars to your eyes in 2018? MAC gave us all the feels with this cherry bomb lip look at Philosophy's Spring Summer 2018 show. The majority of color was concentrated on the lower lip, whilst the upper was given just a subtle stain. Finish with lipgloss (obvs). Yes, a super-sharp cat-eye looks kinda cute, but a blunt, graphic liner look is so much cooler. Highlighter roams free in 2018, no longer bound to just the cheekbones or cupid's bow. Illuminated skin calls for plenty of prep work. Use a complexion-brightening base, then mix a liquid highlighter with your everyday foundation to create a perfected, glowy base. Finally, take a radiance powder on a big powder brush and lightly dust it over the high points of your face. Gray lips may sound kinda scary, but they can actually be oh-so pretty. Team with a smudgy black kohl eyeliner and you're good to go.